Marketing U coaches hold both your heart's passion and your feet to the fire. Marketing U® is dedicated to the success of entrepreneurs, senior leaders, and corporate executives with the desire to take their life or business to the next level. Working with a Marketing U coach you gain a strategic partner, mentor, sounding board, confidante, and conjurer of ideas. Our coaches guide you to attract the extraordinary into your life, business, or profession by holding you accountable to your dreams, your commitments, your values, and your priorities. Who hires a Marketing U coach? How is coaching different than consulting or therapy? The coaching relationship operates in an environment of trust. It is a collaborative partnership designed to encourage growth and rapid change with one singular focus: YOU! wanting to dramatically expand perspective so they can easily see new opportunities and solutions. wanting to establish coaching as a model of leadership. who need to manage their clients better. who want to create a sustainable business and livelihood from using their creativity. Sound like you? Ready to hire a coach? communicate what you need and want from others in a more responsible way. At Marketing U your first session with your coach is free. We want you to be sure that your needs and our skills are the perfect fit. Coaching is a partnership based on mutual trust and an agreement to advance your goals or vision. We primarily coach clients over the phone, during regularly scheduled calls, three times a month. We welcome calls in-between to celebrate your achievements or when a lift is needed, and encourage our clients to stay in contact via e-mail. Marketing U clients pay monthly. Typical fees range from $650 to $1,250 a month for coaching by phone, depending on the number of hours required in any one month. Though we prefer to meet by phone, we sometimes meet with clients "in person." In-person fees are higher and take into account time out of the office. Our typical day rate is $2,500 (not including expenses). We also provide group coaching opportunities on specific communication skills and leadership topics. Fees vary depending on topic, size of group, and number of hours required. In the case of group coaching there may also be charges for prep and program design. How is coaching different from consulting or therapy? Imagine that youre goal was to compete in the Tour de France. You reply, "I can't ride a bike." The therapist response might be to ask you to find a time where the resistance/fear to bike riding first occurred? What happened, who was there, what was said? A consultant might measure your leg, and then measure the length of the seat to the pedal, draw you a diagram of your leg, the pedal, and wheel and leave you with you a how-to manual including a detailed description of the theory of motion and physics. "If you are willing to get on the bike and start pedaling, I am committed to holding the back of your seat and running beside you until you can balance yourself and maneuver the bike safely." In coaching, we don't focus on what was and we don't leave you with "how-to" manuals. We do what needs to get done to help you meet your goals. Are you ready to get on the bike? 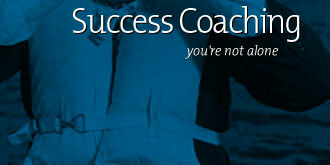 All Marketing U coaches are CoachU graduates and members of the International Coaches Federation.